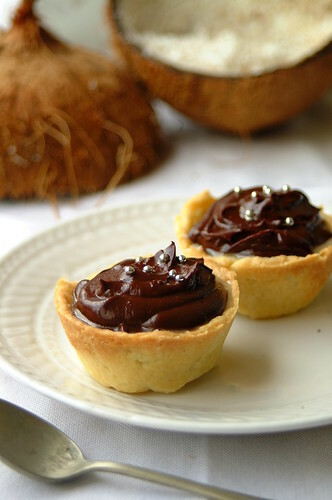 Bordeaux chose Coconut Chocolate Tarts as the theme (recipe taken from Donna’s book New Fast Food — which I have yet to procure!). The coconut comes in the crust — a delicate thing made with flaked coconut, sugar, and egg whites. This is topped with a dark chocolate filling and then popped in the freezer for a bit to set. Bordeaux gives us leeway to expand and adpat the theme as much as we want…so I decided to play around a bit. Instead of the coconut crust, I used a regular pie crust (the same one I used for this lemon meringue pie) and pre-baked them in a muffin tin. I used the same recipe Bordeaux provided for the chocolate filling. And for the coconut? 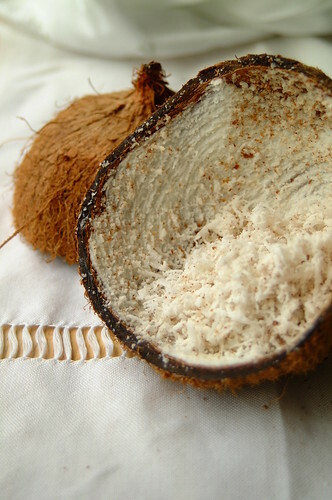 I decided to celebrate the abundance of coconut we have been blessed with over here by using freshly grated coconut (yes! available at a grocery or market near you!)! I also wanted to add another element in the tart and decided to use sweetened condensed milk. I know, I can abuse my right to sugar sometimes. But I have my reasons! There was this simple snack we were taught to make in high school which consisted of white bread dipped in condensed milk, then dredged through freshly grated coconut, then toasted in the oven. Really, it sounds strange, but it was delicious! So I wanted to use some of that combination here. So here is how my tart went: Make crust. Cool. Drizzle a layer of sweetened condensed milk on the bottom of the crust. Top that with freshly grated coconut. Top with chocolate filling. Set as per instructions. Eat and enjoy!